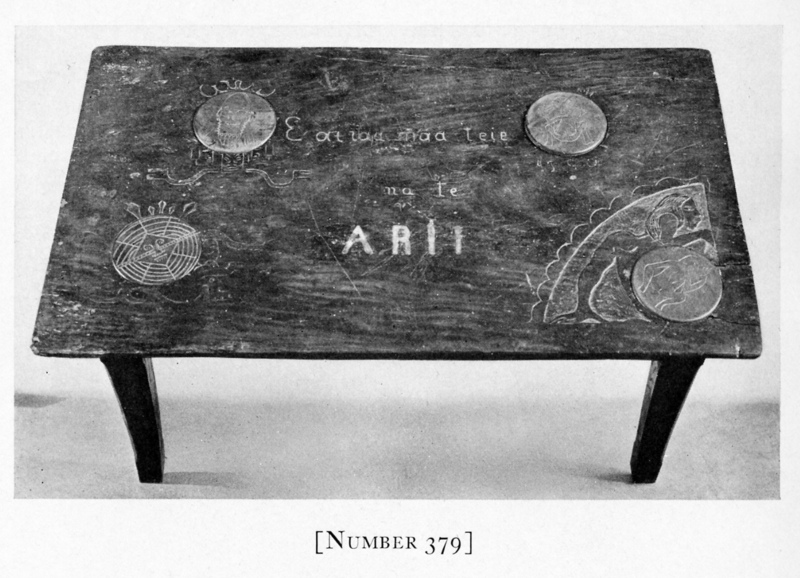 Gauguin’s Furniture – Missing Since 1960. Furniture is not what comes to mind when thinking of artist Paul Gauguin. He worked in many mediums, including ceramics, and it is known that Gauguin lamented the demise of the importance of decorative arts in late nineteenth century France. He considered sculpture and furniture equally in stature calling them “intelligent sculpture.” One known cabinet, made for his home in Copenhagen, can be seen in Fonsmark's essay, ”Gauguin Makes Objects,” from the exhibition catalog, Gauguin and Impressionism. This story, found in the Ingalls Library clipping files, begins in the South Seas. Artist Cora Timken Burnett and her husband traveled to Tahiti in 1923, searching for any pictures or carvings by Gauguin. They found none, but did connect with Gauguin’s son. It was, “in the interior that we were able to procure from him the last of Gauguin’s possessions,” a table and a bench, or settee, made of apatong wood, an indigenous redwood. 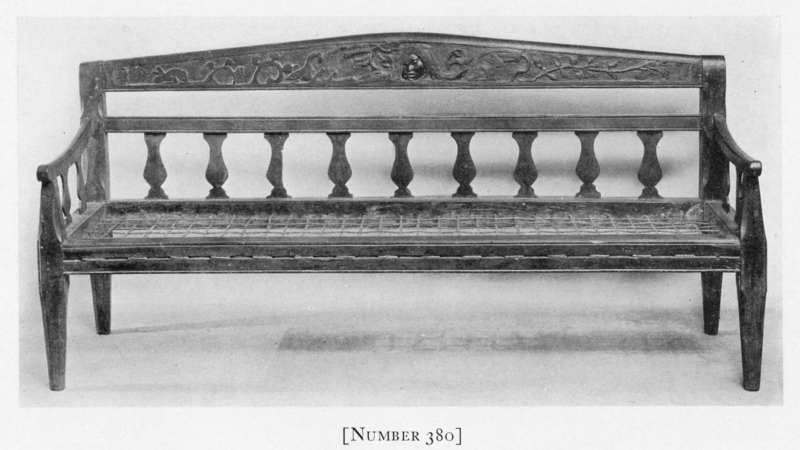 The furniture was given to Gauguin by a Tahitian Chief, and carved by Gauguin during his last stay there. Returning to their unique New York estate situated high above the Hudson, Cora fit the furniture into her art collection. In 1929, Cora put her collection up for auction at American Art Association / Anderson Galleries, where the table and bench were photographed and described in the New York Evening Post and the New York Herald Tribune. Headlined as "Rare Tahitian Art Objects," they held no appeal to buyers, and sold for the paltry sums of $325 and $375 respectively. Who bought them? December's 1929 Art Digest describes "the buyer being a young woman who kept her name secret." And then, almost thirty years later the New York Times reveals that Cora bought them back! The New York Times article, dated March 17, 1960 heralds "$15 Gauguin Table Put Up At $50, 000." Now being displayed at the Hammer Galleries in New York City, the table resurfaced three years before at a small auction house in New York. Mr. Jon Streep, a Park Avenue art dealer, purchased it for $15. Cora died in 1956, and the furniture went to auction locally. Mr. Streep found Cora's husband, who related the story of the furniture and the secret buyer before Dr. Burnett himself, died in 1959. And that, dear reader, is where the story ends, at least for now. We know that the bench did not come to public attention again. The table sells for peanuts and ends up in the Hammer showrooms for 50K. Did it sell? I called Hammer Galleries and told this tale of woe, hoping that they might find the trail in their records. So far, not a word. But wouldn't you just love to know where these priceless pieces of furniture, carved with Polynesian figures, animals and a spider web, reside? My wish, I hope they are loved.